FREE Racquetball Clinic – Today! 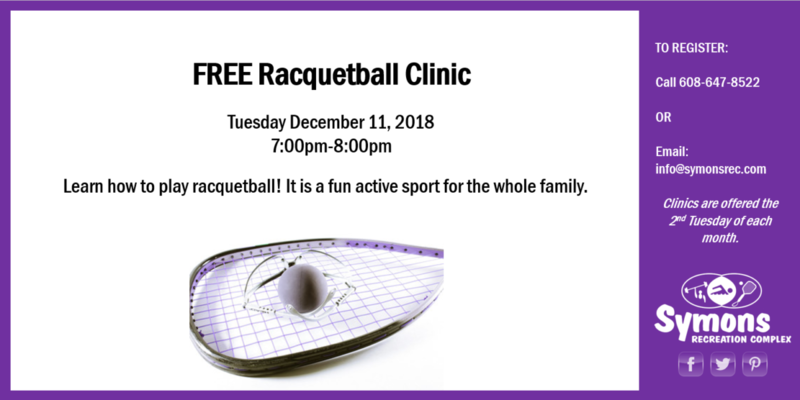 News / FREE Racquetball Clinic – Today! Racquetball is a great form of exercise! Try a FREE Racquetball clinic to learn how to play! Clinics are held the 2nd Tuesday of each month, call ahead to reserve your spot! Fitness Benefits of Racquetball : The President’s Council on Physical Fitness lists racquetball as one of the cardio activities which, if engaged in for twenty or more minutes, will provide the level of activity needed to maintain fitness. More specifically, playing racquetball at moderate intensity burns up to 794 calories per hour, and results in a high heart rate that is sustained throughout the work out. Plus it is FUN!